I am a mass communication major concentrating in journalism and I love following other journalists and learning about them, they are all kind of like celebrities in my eyes. This year, I became the president of the student chapter of the Society Professional Journalists which meant I was in charge of choosing speakers. So, I set the goal of getting Hoda to come. I had tried through twitter a few times and then in January I found out she was doing a book signing in New Orleans so I went and asked her to speak at Loyola and she agreed. I got in touch with her again through twitter and then we planned through email and things fell into place to where she is coming this week to speak. 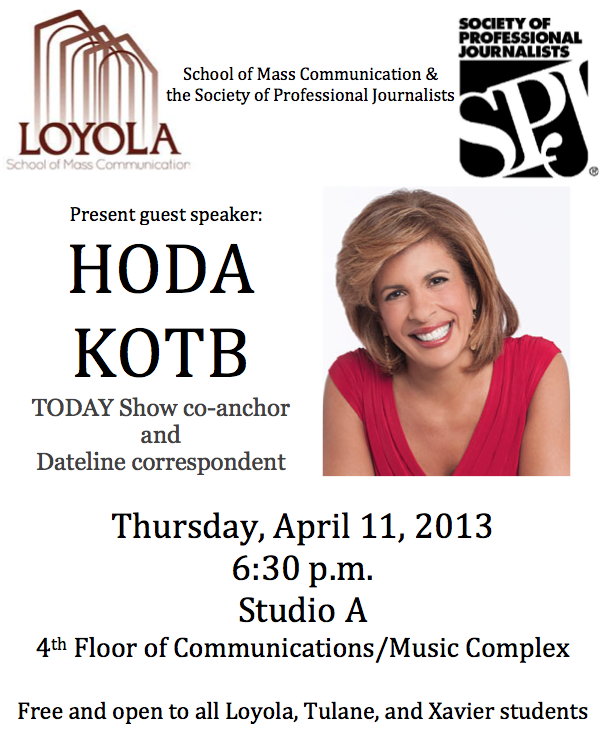 Thursday, April 11 from 6:30-7:45 p.m. in Studio A, which is the fourth floor of the Communications/Music Complex. The event is free and open to all Loyola, Tulane, and Xavier students.